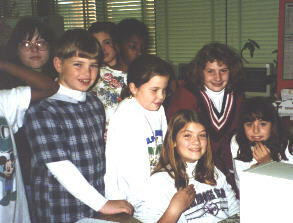 Mike Burleigh (United Kingdom) and I began using KIDLINK IRC to enhance ourlessons in the spring of 1993. We sent e-mail and used IRC to prepare for thechats. At first only the two of us used this medium but then we widened thescope as Social Studies teacher at Delmar, Martha Pfeiffer, and her studentsjoined in. We also invited a student form Cairo, Mariam Shenawi, to talk toour students about Egypt. John Ost, KIDLEADR from New Hampshire, took the IRC a huge step forward andarranged an IRC chat with Zlata Filipovic, young author of Zlata'sDiary. Zlata has been called the "Anne Frank of Sarajevo." KIDLINK IRC is a *safe* place for KIDLINK kids to chat. To find out moreabout KIDLINK and KIDLINK IRC take a lookat their WWW pages. Preparation for the IRC - "Virtual Tour of theRiver Thames"
IRC lesson logfile - "Virtual Tour of the RiverThames"
IRC lesson logfile - "A Chat With Henry VIII"
IRC Lesson logfile - "A Virtual Visit to Cairo"
IRC logfile - "A Visit With Zlata"
A collection of ten lessons by Mr. Bill Parks, UNICEF Education Representative, conducted with KIDLINK kids on KIDCLUB IRC from September to December in 1993.